Offering many musical choices including swing, jazz, standards, Broadway and more. Jump Jive n' Wailers offers selections that span a century of great music. You may want standards by Cole Porter, the Gershwins and Glenn Miller. Or, you may prefer more recent music ~~ how about The Beatles or Andrew Lloyd-Webber? The musicians in this group have a total of almost 200 years of playing experience in all kinds of ensembles, including small jazz groups, big bands and even concert wind ensembles. 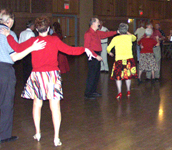 They are currently performing throughout the Valley in such groups as the Myron Sommerfeld's "Music of the Stars," Burgie Crandall's "Let's Dance Band," Terry McFee Band, Danny Kealey, Ted Nastoff, Doming Gomez as well as other dance bands, community bands and concert groups. Jump Jive n' Wailers players have performed all over the United States including Los Angeles, Chicago, Kansas City, Las Vegas, San Francisco and many cities in the midwest.